Get ready to rock and roll. If you want to enjoy music from a variety of sources while on the road, the CDX-GT35U Xplod car stereo CD receiver is the way to go. 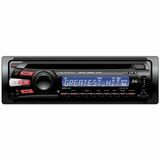 The easy-to-read LCD display shows clock, station ID and track data while playing back your digital MP3, WMA or AAC music files from either a CD or a portable audio device via the USB or front auxiliary inputs. An enhanced listening experience is in store thanks to 52 watts of peak power delivered to all speakers-and when you're ready to expand the experience, selectable rear or subwoofer pre-amp RCA outputs are available for external amplifiers. And with a supplied wireless remote, you can conveniently control your music without taking your eyes off the road.